One well-planned week is all it will take to make an entire locality having around 1000 households to start segregation. So if we had just about 10 interested people in each ward, we could get the whole of Bangalore to segregate at source in just one week. I mean it. This begs the question – Why on earth is it not happening? It is after all not so difficult to get 10 people in each ward to get this going, right? Ah, that’s where we are completely missing the point; the garbage crisis here has nothing to do with people not willing to segregate. The problem is that there seems to be too much to be gained by allowing Bangalore to drown in its own garbage. Leave aside the bottom three layers of the system comprising Pourakarmikas & garbage collector, the Area Supervisor and perhaps Health Inspector, and it seems as if all the others who are higher up in the rung are doing the best they can to make sure that the problem never ends. This morning, Kumar (the driver of the second garbage auto where we initiated segregation) was nearly in tears and almost gave up. He said that he is tired of this work and wants to quit. He had put in so much sincere effort all of last week to make residents give only segregated waste and did a wonderful job in making sure 80% of the waste from his area was segregated in so little time. We were shocked to see that after all this, he began collecting mixed waste today. In fact, residents were disappointed and asked us why we are making them give mixed waste when they willingly began segregation. The answer – Kumar has been given orders to not make people segregate and to collect only mixed waste. By who you ask? On the first day when we started shadowing Kumar’s auto and were quietly observing how he was asking residents to segregate, there was a sudden interruption. A young man on his bike barged in and threatened Kumar to stop segregation. The man said “If I see you asking people to segregate, I will make sure you are thrown out of your job. You will shut up, collect the waste and go divide it at the point of dumping. And come to my lane first, you can cover the rest later…”. The wonderful young man was the Corporator’s driver, who regularly makes such threats and ensures that nobody segregates in this locality. Did I mention that this ward is part of the Kasa Muktha (Zero Garbage) initiative? And did I not say that our respected Corporator is also Chairman of the newly formed Health Committee? Backing the word of the Corporator’s driver is the P.A to the Corporator, another wonderful gentleman, who from day one has been fussing about the fact that we have been returning his plastic covers given with wet waste, and insists that we cannot inconvenience people like this. It is interesting to note, that of the 800+homes in this locality, only the corporator’s men seem to be inconvenienced by segregation. We have been able to form small resident groups in several streets who very happily volunteered to make sure segregation happens. 1. Lack of will: Simple lethargy to get things moving. We have been talking repeatedly to make the option of KCDC happen so that we could send the wet waste there. It has been two months since we requested the AEE to send a letter to KCDC. Nothing has moved. A “big” meeting happened last week with the JC, the AEEs, the Chief Engineers, the Health Inspectors and others who apparently matter. They made field visits, saw the dysfunctional composting units, made phone calls and promised action. Nothing moved. However, this lack of will, if true, is a far more innocent crime, and we could work around it with patience and perseverance. 2. Pleasing the public: Residents never complain that segregation of garbage is not happening. They only make complaints that garbage is piling up (blackspot) near their homes and demand that it be cleared. We can’t fully blame residents for being unwilling to understand why blackspots get created and how segregating waste will prevent such garbage from piling on the ground. But when authorities decide to act only to please the public rather than to solve the problem, trouble begins. In the attempt to clear blackspots due to repeated complaints, the BBMP forces the garbage auto drivers & Pourakarmikas to collect the mixed waste from the ground. This ruins the entire process of collecting segregated waste as it gets mixed with unsegregated garbage from the ground. The solution here (which we have been requesting) is to assign a separate vehicle to clear blackspots (until our work on prevention starts to show results) and to not merge it with collection of segregated waste. In addition, we are working with residents to prevent creation of these blackspots by ensuring regular door to door pickup of segregated waste and talking to those residents who regularly dump garbage on the roads. This of course, is not as glamorous as one-time clean-up drives. For every blackspot clean-up drive that is done by enthusiastic volunteers, two others might get created if we fail to stop the problem at its source. But, who is willing to look deeper to understand the real issue? The common man, with his limited understanding, simply wants to complain and demand quick action. While the authorities, despite complete understanding of the issue and how it can be prevented, quietly dances to public demand and keep plugging the holes, instead of stopping the leak. These problems, I am willing to understand and get involved in to find solutions and to work with the authorities, garbage collectors and residents. But how do you even begin to understand problems that can’t be seen ? What do you work on when you are unable to put your finger on what other unforeseen forces are acting? What should you make of it when you are told by the AEE that landfill is really the only solution and that KCDC, despite the court order, can’t really handle waste? What do you do when the planned meeting with the Corporator and AEE to make the entire ward begin segregation, gets postponed three times in one week, only to be finally cancelled? What forces are acting on the Health Inspector and Area supervisor which makes them force the garbage collectors to pick up mixed waste, despite their interest and understanding of the need to segregate? What sense does it make when the Corporator first tells us that he is committed to making this ward a Zero Garbage zone and then his own men are actively preventing people from segregating at source? We are willing to work with the reality, however ugly it might be. But first, can someone tell us what this reality is? 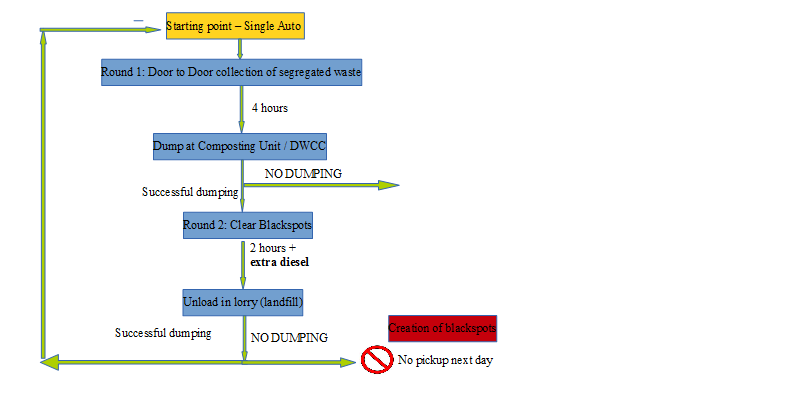 Pick up and disposal using the same auto:First, the auto guys have to pickup segregated garbage from homes and dispose it in the DWCC or Composting Unit. Then, they have to come back to pickup the GoG and unload it in a truck which goes to the landfill. It must also be noted that this is a double work for the garbage collectors who have to put in up to 6 hours and two rounds of work each day; naturally, they are reluctant. Consequences: This will put the entire Segregation at Source from homes in a shaky situation. If we pickup the GoG which is mixed waste, we have to unload it into a truck which goes to a landfill. If the truck is unable to dump it in the landfill, the autos will not be able to unload and hence cant go for the next day’s pickup. That means, residents will lose faith about the garbage pick up and continue dumping on ground, creating blackspots. Possible solutions: Arranging separate pickups and making a separate disposal plan for mixed waste and segregated waste has to be done. This means, we need to assign a separate vehicle for clearing GoG. We are told that this requires a new tender and will take around 6 months to implement. Meanwhile, we could motivate the garbage collectors to do two rounds for door to door pickup, followed by clearing GoG. But even for this, provision for extra fuel and consideration for extra man hours has to be made. Even if the garbage collectors are willing to do extra work, forcing them to collect mixed waste and putting pressure on them to clear blackspots, risking and preventing segregation at source, is not the way. Sinu Joseph is an engineer, who is currently working in the social space, understanding the last mile connections from ground zero.